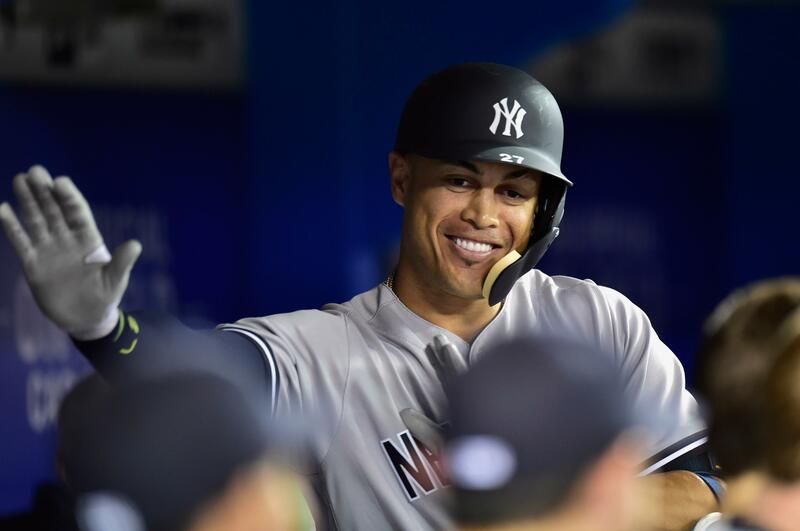 UPDATED: Thu., March 29, 2018, 11:01 p.m.
Giancarlo Stanton homered twice, doubled and had four RBIs in his Yankees debut and the New York Yankees defeated the Toronto Blue Jays 6-1 in Toronto on Thursday. The win gave Aaron Boone in a win in his first game as a professional manager. Winning pitcher Luis Severino pitched 5 2/3 scoreless innings for the Yankees, who won their opener for the first time since 2011. Acquired from Miami after leading the majors with 59 homers, Stanton hit a two-run homer in the first off loser J.A. Happ, an RBI double in the fifth and hit a solo homer in the ninth off Tyler Clippard. Mariners 2, Indians 1: Felix Hernandez pitched shutout ball into the sixth inning, Nelson Cruz hit a two-run home run in the first inning and the Mariners opened with a win over Cleveland in Seattle. Hernandez became the seventh pitcher to start at least 10 straight opening days, and he got off to a strong start against one of the best teams in the American League. Hernandez allowed two hits in 5 1/3 innings, only being pulled due to a limited pitch count after being hit by a line drive during spring training and missing some time. Hernandez (1-0) was given an early jolt from Cruz, who picked up where 2017 left off. After hitting 39 home runs last year, Cruz hit the first pitch he saw from Corey Kluber (0-1) over the center field fence for an early 2-0 lead. The 88 mph cutter stayed in the middle of the plate, and Cruz didn’t miss. Diamondbacks 8, Rockies 2: Jake Lamb doubled and singled to drive in four runs, Patrick Corbin struck out eight while pitching into the sixth inning and Arizona defeated Colorado in Phoenix. White Sox 14, Royals 7: Matt Davidson became the fourth player in major league history to homer three times on opening day, Tim Anderson homered twice and Jose Abreu went deep for Chicago in a win over the Royals in Kansas City, Missouri. Winner James Shields surrendered four runs in the first inning but wound up lasting six innings, holding his former team without a hit after that shaky first. Davidson became the fourth player with a three-homer performance on opening day, joining Detroit’s Dmitri Young (2005), the Cubs’ Tuffy Rhodes (1994) and Toronto’s George Bell (1988). Chicago matched the record for home runs on opening day, set by the New York Mets in 1988. Danny Duffy took the loss and was followed by eight relievers. Cubs 8, Marlins 4: Ian Happ became the second player to homer on the first pitch of the major league season, and Anthony Rizzo made his emotional homecoming even more memorable with a home run in Chicago’s win over the Marlins in Miami. Rizzo homered into the upper deck in the second inning – an unscripted tribute to the victims of last month’s shooting at his former high school in Parkland, Florida. As he crossed home plate, Rizzo patted his chest and pointed to the sky. Happ pulled the first pitch from Jose Urena into the seats. Dwight Evans is the only other player to connect on the first pitch of a season, doing it for the Red Sox in 1986 off Jack Morris at Tiger Stadium, the Elias Sports Bureau said. Steve Cishek stranded four runners in two scoreless innings for the win. Athletics 6, Angels 5 (11): Marcus Semien singled into an empty center field with one out in the 11th inning, beating Los Angeles’ five-man infield as the Athletics won in Oakland, California. Shohei Ohtani connected for a single on the first pitch he saw in a much-hyped major league debut for the Japanese two-way star. Boog Powell hit a one-out triple off loser Noe Ramirez to start the winning rally. Matt Joyce was intentionally walked to bring up Semien, who delivered his first career game-ending RBI. Chris Hatcher got the win. Giants 1, Dodgers 0: Joe Panik homered off Clayton Kershaw in the fifth inning, and visiting San Francisco dealt the three-time N.L. Cy Young Award winner his first loss in his franchise-record eighth consecutive opening day start. It was the first run allowed this year by Kershaw, including spring training. The seven hits given up by the left-hander are the most off him on opening day, when he is 5-1. Andrew McCutchen, acquired from Pittsburgh during the offseason, was 1 for 4 with a double in his Giants debut. Evan Longoria, obtained by San Francisco from Tampa Bay, was 0 for 4 with three strikeouts. Ty Blach (1-0) pitched three-hit ball over five innings, and Hunter Strickland closed out the ninth for his first save. Astros 4, Rangers 1: World Series MVP George Springer hit a leadoff homer in the opener for the second year in a row and Justin Verlander pitched six scoreless innings as Houston started its championship defense with a win over Texas in Arlington, Texas. Springer hit a 2-0 pitch off Cole Hamels, becoming the only player in MLB history with leadoff homers in consecutive season openers, according to Elias. Jake Marisnick also homered for the Astros. Verlander is 6-0 with a 0.90 ERA in six regular-season starts since he was acquired from Detroit. Mets 9, Cardinals 4: Yoenis Cespedes drove in three runs and newcomer Adrian Gonzalez hit a go-ahead double as the Mets defeated St. Louis in New York. Winning pitcher Noah Syndergaard struck out 10 and walked none in six innings after missing most of last season with a torn lat muscle. Leadoff man Brandon Nimmo, subbing for injured All-Star Michael Conforto, reached safely four times and scored twice as the Mets chased Carlos Martinez in the fifth inning to make Mickey Callaway a winner in his first game as a manager. Rays 6, Red Sox 4: Denard Span made a huge splash in his debut for his hometown team on opening day, lining a bases-loaded triple to highlight a six-run rally in the eighth that sent Boston’s Alex Cora to a loss in his first game as a major league manager. Span’s triple was only Tampa Bay’s third hit of the day and gave the Rays a 5-4 lead. Adeiny Hechavarria followed with an infield single off Carson Smith (0-1), providing a two-run cushion for closer Alex Colome to earn a save. Boston’s Chris Sale allowed one hit and struck out nine in six scoreless innings. Boston built a 4-0 lead against Chris Archer, with Eduardo Nunez hitting a two-run, inside-the-park homer. Orioles 3, Twins 2 (11): Adam Jones homered on the first pitch from Fernando Rodney leading off the bottom of the 11th inning, and the Orioles won their eighth straight opener, defeating Minnesota in Baltimore. Winning pitcher Richard Bleier worked one inning for the Orioles, who made the most of five hits. Minnesota has lost nine of its last 10 openers, including three against Baltimore. Brewers 2, Padres 1 (12): Orlando Arcia singled in Ji-Man Choi with two outs in the 12th inning and the Padres defeated Miwaukee at San Diego. Jeremy Jeffress pitched two innings for the win. Jacob Barnes struck out the side in the 12th for the save. San Diego newcomer Eric Hosmer, signed to a $144 million, eight-year contract in spring training, went 0 for 4 with a walk and two strikeouts. Braves 8, Phillies 5: Nick Markakis hit a three-run homer off Hector Neris with two outs in the ninth inning, capping a comeback from a 5-0 deficit and the Braves defeated Philadelphia in Atlanta. It was Phillies manager Gabe Kapler’s first game as a big league manager. Freddie Freeman and Ozzie Albies also homered for Atlanta, which won with a walk-off hit on opening day for the first time since 1998. Arodys Vizcaino struck out the side in the ninth for the win. Published: March 29, 2018, 8:31 p.m. Updated: March 29, 2018, 11:01 p.m.